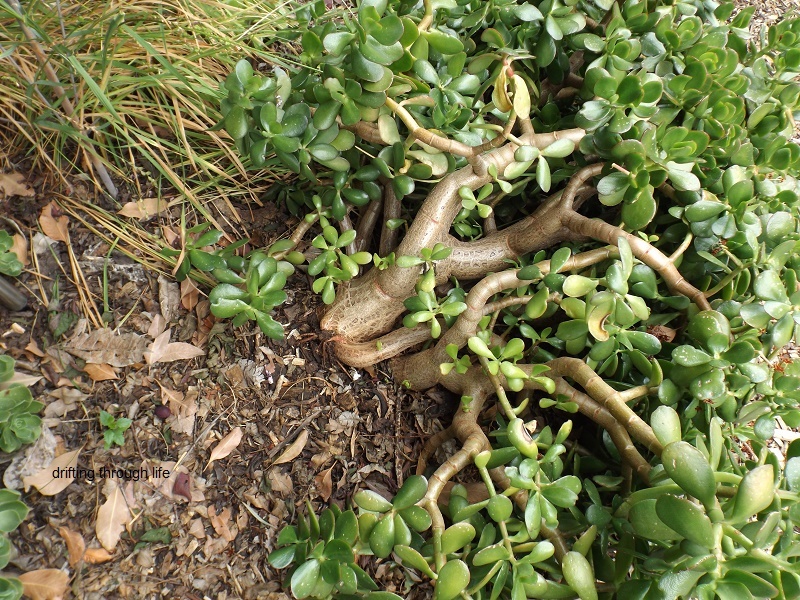 moving into the garden, one of my jade plants has fallen over, it seems the soil is too dry to hold the weight of it. you can see here some of the roots are exposed, they're a lot smaller than I expected for a plant this size. and bigger shoots a bit further around. If I left it they would cover up the exposed branches and it would just look like a squat version of the others, but I don't like it like this and something will get done about it soonish. 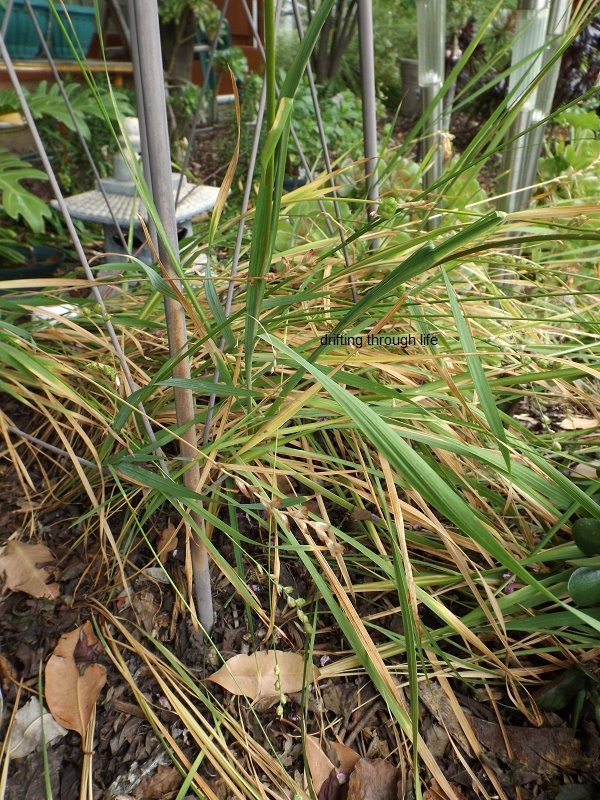 the ixia stems are all droopy and untidy, I'll wait until they've all browned off then cut them just above ground level. and all those untidy freesias. Illuminated pumpkins in the shape of the Statue of Liberty are on display during the Great Jack O'Lantern Blaze at Van Cortlandt Manor in Croton-on-Hudson, New York. 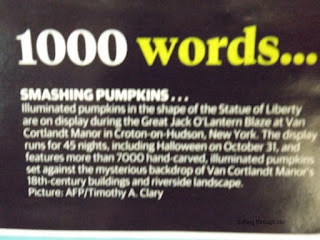 The display runs for 45 nights, including Halloween on October 31, and features more than 7000 hand-carved, illuminated pumpkins set against the mysterious backdrop of Van Cortlandt Manor's 18th century buildings and riverside landscape. I would guess your jade needs more arable soil, that can be spaded deeper. 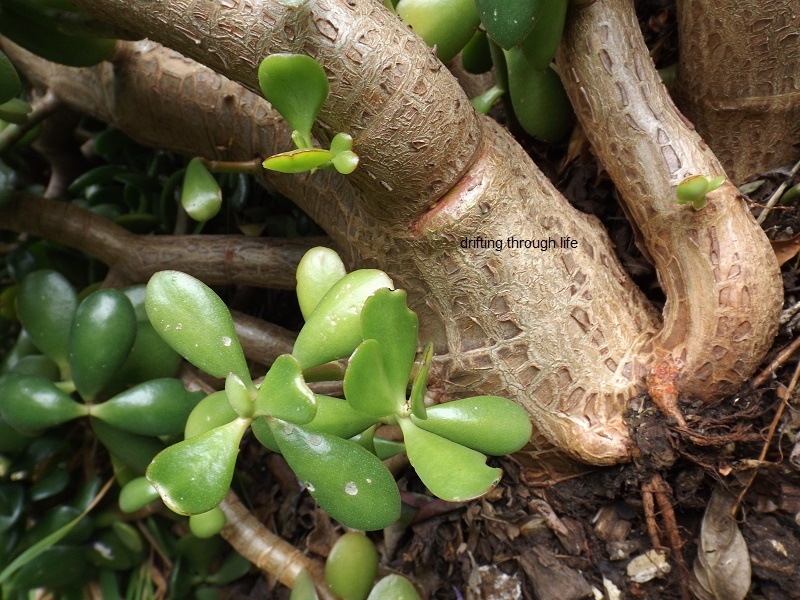 Even in pots, our jade had large root balls. Well, that's all I know. Joanne; these jades are only 3-4 years old, and I knew when I put them in the soil wasn't suitable, but it's all I've got and full of tree roots from the plum trees and then there's a million ants and people walking through whenever they please. I'm surprised the jades have done this well. I'll trim it and replant so it's upright and cross my fingers. Love the pumpkin Statue of Liberty!! fishducky; I do too, it really stood out when I saw it in the paper. You are a much tidier gardener than I am. I leave the leaves until they disappear. 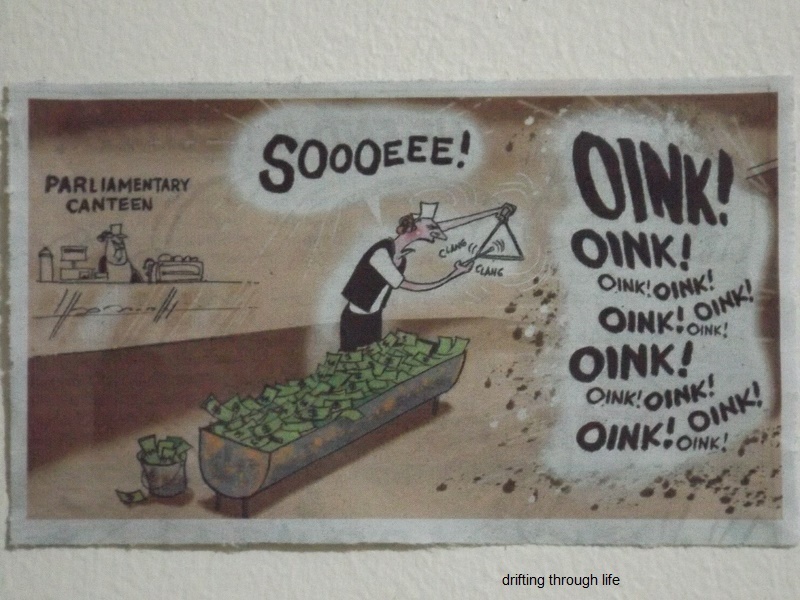 The Parliamentary canteen cartoon is sooooo right. Elephant's Child; I've tried to do that, but the neat freak inside is baring her claws getting ready for war. 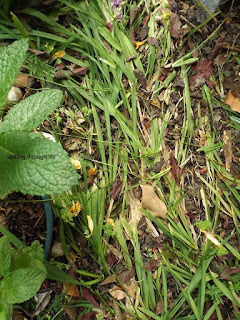 those patches are otherwise bare when the bulbs aren't flowering and I don't like that either. It's a dilemma. 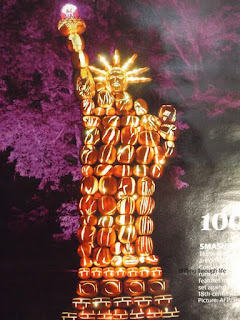 Goodness the pumpkin Statue of Liberty, quite amazing. Lowcarb team member; I'm amazed at what some people think of. 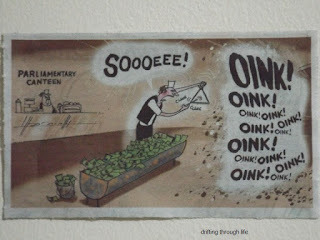 I would never have thought to do that, it's so clever. That Statue of Liberty is fantastic. Hard to believe something so artistic can be done with regular pumpkins. I love to see new green buds and shoots in the spring. It seems miraculous no matter how many times I see it! Hope you are making progress with your internet issue. jenny_o; the internet issue will have to wait. I'll print out the pages today and check every day against the hours they say I've been on, but without knowing just where I was online at any particular hour it's going to be confusing. 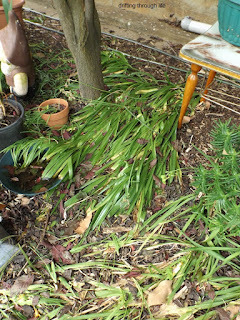 I love seeing new spring growth too, although here in Australia there is always plenty of green anyway. 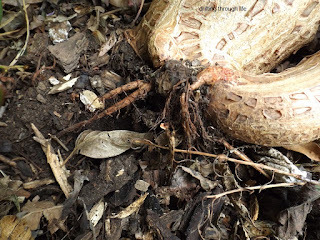 At first I thought your Jade tree root was a snake and I had my reading glasses on. peppylady (Dora); we don't get a lot of snakes around here, plenty of blue-tongue lizards though. A very clever use of the pumpkins on Halloween Day. After the rain we had a last week everything around here has lapped it up, put it to good use and is growing like wildfire. Lee; we had plenty of rain overnight for a few days but that's gone now and I have to start the weekly watering again. I haven't watered since last summer, that's why the ground got so dried out. Too dry for a jade plant is TOO DARN DRY! I have a jade plant in a pot on my kitchen table, and I don't ever remember watering it over the years. Hick may give it a drink every couple of months without telling me. It seems to be thriving. Gets the morning light. Of course, being inside, it's protected from the wind and bugs. Val; inside in a pot? How big/small is it? Mine are only young and already too big to be inside, they will eventually be as tall as me and as wide as they are tall. I if remember to give them a drink now and then. I thought they'd be okay over the winter without watering, silly me. So many people can't grow Jade plants, we hare in Tasmania have to be clever so they don't get a touch of the frosts in winter - so many over water them. Margaret-whiteangel; yes, they are a hot dry area plant, a small drink once a week when getting them started, a bigger drink less often once they are established, is all they need. Would love to see that Statue of Liberty in person. Amazing. 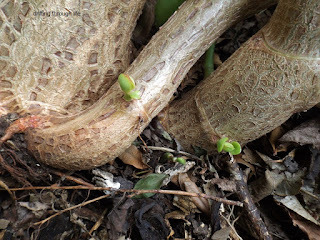 Your Jade plant seems determined to take care of itself with the new shoots coming on. It's also kinda funny that you saw a pic of that pumpkin statue of liberty there in Australia, and I didn't see any mention of it in out newspaper.